Attended circus with his mother Helen Kaminski and his cousin John "Jack" Tomasi. Attended circus with her son Al Kaminski and her nephew John "Jack" Tomasi. Attended the circus with her brother, her aunt, and a few cousins. Attended the circus with his sister, his aunt, and a few cousins. He was rescued by a sailor. Attended circus with other soldiers from a nearby rest camp. Went to the circus with his siblings Daniel and Arlita. As Alfred recalls, "we didn't have a lot of money, and we could buy expensive seats and no candy, or cheap seats and get some candy." They got the candy and that's partly why they all survived. Attended the circus with her brothers Alfred and Daniel; all of them survived. Hartford firefighter with Engine Co. 16. His children Alfred, Daniel and Arlita Kenny went to the circus while their father was at work, stationed at the Blue Hills fire house. When Mr. Kenny responded to the circus grounds after the fire, he knew his children were at the circus and with every little body he turned over he expected to see one of his own. Attended the circus with his siblings Alfred and Arlita; all of them survived. Went to the circus with her brother Stowell Kessler and their mother Helen Kessler, and Helen W. Fyler and her son David Fyler. The group sat in the southwest bleachers, and exited out the main entrance without any injuries. Went to the circus with her children Stowell and Carol Kessler, and Helen W. Fyler and her son David Fyler. The group sat in the southwest bleachers, and exited out the main entrance without any injuries. Went to the circus with his sister Carol Kessler and their mother Helen Kessler, and Helen W. Fyler and her son David Fyler. The group sat in the southwest bleachers, and exited out the main entrance without any injuries. Chief of Hartford Fire Department at time of the fire. Attended circus with her daughter, Mrs. Sumner Johnson, and her two grandchildren. Went to the circus with a friend and injured his left knee when he jumped down from the bleachers. He and his friend both survived. Georgianna, Barry, Dorothy and Roberta Kuhnly. Roberta was born 3/10/1935 in Rockville, lived in Rockville until after the fire when she lived with her grandparents in Granby. Attended the circus with his father, Stanley Kurneta; his cousin Raymond Erickson, Jr.; his aunts Elizabeth and Mary Kurneta; and his grandmother Mrs. Frances Kurneta. 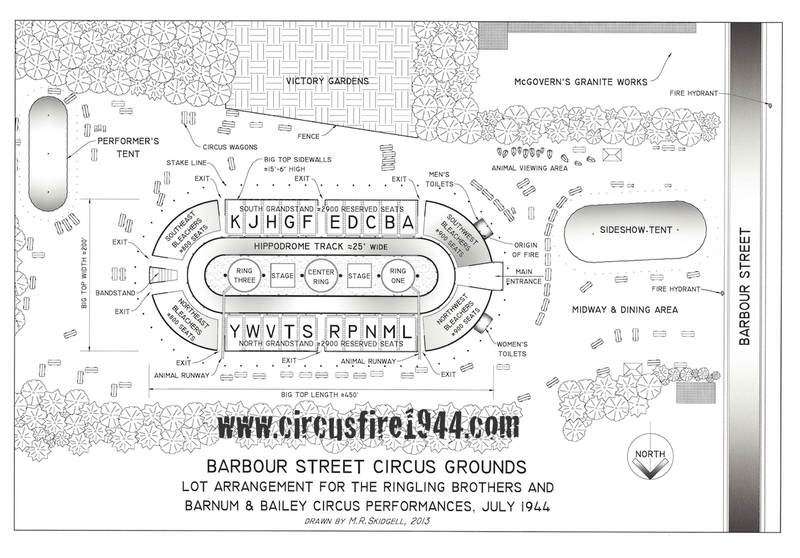 Anthony, Elizabeth and Frances were led out of the burning tent by Stanley; Mary was found dead at the circus grounds and Raymond was presumed to have died although his body was never found despite his uncle having brought the boy to the hospital in bad shape, though alive. Read more from Anthony Kurneta here: Personal Accounts - Page 7. 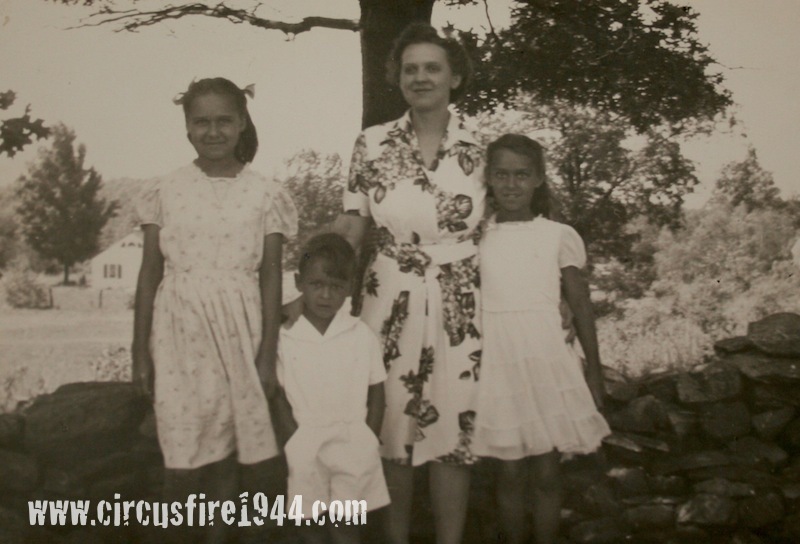 Attended the circus with his mother, Mrs. Frances (Platek) Kurneta, his sisters Elizabeth and Mary Kurneta, his son Anthony Kurneta and his nephew Raymond Erickson, Jr. The group sat in reserved section 'S' to the left of the main entrance, four rows from the top, and across from the center ring. When Stanley noticed the fire to the right of the main entrance, they all hurried toward the main entrance. Stanley pushed Frances and Elizabeth over the animal chute, but lost Mary and Raymond in the crowd. Stanley later found Raymond, seriously burned and in wet clothing, and rode with the boy in an Army truck to Municipal Hospital where he is presumed to have died although his body was never found. Mary was found dead at the circus grounds. Stanley was hospitalized for his injuries.